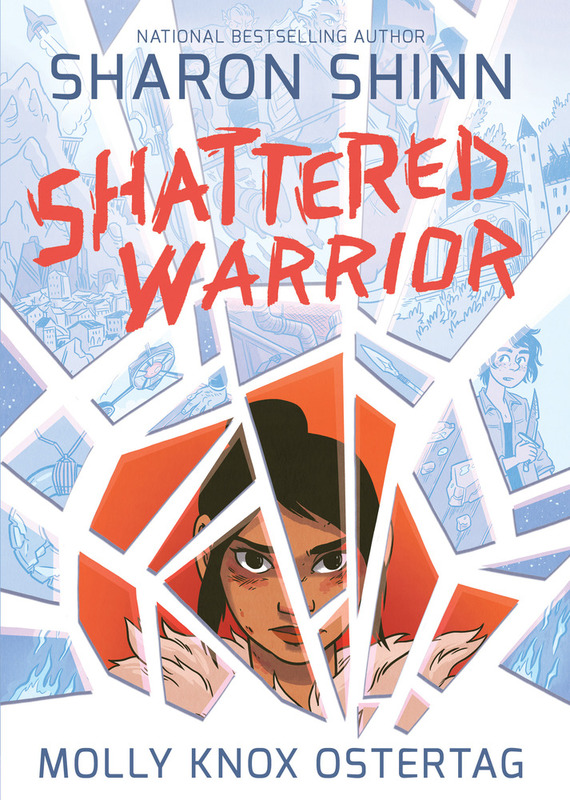 Today’s review is part of the blog tour for Sharon Shinn's new graphic novel, Shattered Warrior, illustrated by Molly Knox Ostertag. It’s sci-fi, with a resistance fight and a love story (sounds a lot like Star Wars, eh? )(read it and find out!). Sharon Shinn! Oh man, talk about one of the greatest discoveries of my blogging life – I found Sharon Shinn’s books through a blog challenge, and now I keep a sharp eye out for everything she does. It may or may not hit all of my sweet spots, but her work is always emotion-inducing (by which I mean I usually cry AND want to throw her books across the room/hug them in equal measure). tl;dr Sharon Shinn makes me read books/plots/subgenres I didn’t know I wanted, and like it. Folks, when I heard she had a sci-fi graphic novel coming out with one of my favorite publishers, I was IN, 110%, YES PLEASE AND THANK YOU, and I was not disappointed. But Colleen must decide if it's worth risking all of their survival to join a growing underground revolution against the Derichets ... in Sharon Shinn and Molly Knox Ostertag's Shattered Warrior. Not long ago, Colleen Cavenaugh was a beloved daughter of the great house of Avon, and she and her sister were showered with luxuries. Then the Derichets came and Colleen lost her whole family, and everyone on the planet lost their freedom. Now Colleen lives alone in her empty house and works in a factory sorting precious minerals for the Derichet overlords – and does not let anyone or anything touch her heart. That fragile cocoon is broken when a band of Chromatti threatens her safety, her lost niece is found, and the Valenchi resistance turns from rumor to real. Will she act, or will she try to preserve the status quo? The answer could change her planet’s future. One of Sharon Shinn’s trademarks is delicious world- and character-building, and though the graphic novel format limits prose a bit, Molly Knox Ostertag’s art adds layers of history and meaning. Colleen’s world is restricted to places she can reach on foot, by bike, or by treadway (underground public transport on moving walkways), and so the scope of the book is narrow – this isn’t a grand starship journey. That said, there is plenty to explore on-planet – the opressive Derichet (who look like nothing so much as the Dark Elves from the 2nd Thor film!) pose an ever-present danger, but the Chromatti (ex-miners tattooed with phosphorous ink who roam about in bands) threaten as well, and Colleen is a particularly vulnerable target as a member of the former upper class, a woman, and a person with dependents. Colleen herself is marked by loss. She lives one day at a time, trying to keep her head down, trying to stay safe and sane. But of course, it wouldn’t be a story if there weren’t things to knock her out of her comfort zone! One of those things is a Chromatti man named Jann, who both frightens and intrigues her in equal measure. It’s one of those “they would never have met if it weren’t for the ‘end of the world’” type of relationships. The delicate communication that Colleen and Jann cultivate ultimately leads to more, and it is one of the best parts of the book. Colleen is also changed by her eventual involvement in the resistance. Though I didn’t love that it took a Derichet’s violence against a woman (this trope is still used to signal evil?! …yeah) to make up her mind, Colleen does get involved in a small way. Officially, the Valenchi “don’t exist,” they blow up transport a la French resistance fighters in WWII, and Colleen does her part but does not immediately become the leader – something that I’ve seen before in stories that always rings false. Subtlety = yesssss! Other things I liked, because this review is getting really long: the stakes are high (plot could mean death! ), gender equality in facing danger and putting everything on the line, old class system & wealth break down in the face of occupation (like Star Wars! ), found family, diversity (seems like it was probably an artist decision more than an author one, but I’ll take it), and a bisexual love interest (heavily implied)(yay!). Things I didn’t like: I wish there had been more page time for the legend the book title is based on, and I also wish there was more of this story, period. I think that further development of the Lucy-Colleen relationship would not have gone amiss. But. If my only complaint is that I wanted more, you know I liked the book! So that brings us to the art, which is just fantastic. Molly Knox Ostertag really takes this story and makes it shine – the illustrations up the stakes, ground it in a place (make Avon & Comstock city come alive! ), make you see and feel the characters’ changing emotions and attachments. The art is where the diversity in skin color, architecture, and clothing all tell their own stories – and come together to make the book something more, to show you a history that is unusual and interesting. I’ll be checking out everything Ostertag has ever done, and I usually don’t say that about art (I’ll say it once in a blue moon about an author, so this is a big thing). In all, Shattered Warrior is a high-stakes rebellion/unexpected love story mash-up with to-die-for art. Read it! Recommended for: fans of Princess Leia, the Saga graphic novels, and older teen and up audiences who enjoy science fiction with love stories and diverse characters. Fine print: I received a copy of this book for review consideration from the publisher. I did not accept any compensation for this post. Scott Westerfeld is a favorite author – an old favorite at this point. I read his YA just after I started blogging (so many years ago omg)! He remains a favorite partly because many of his stories are about girls doing things. The other part is that he writes reliably engaging science fiction (his Leviathan books are so my jam it isn’t even funny). When I found out that he had a graphic novel coming out (with Alex Puvilland illustrating), I couldn’t add it to the to-read list fast enough. 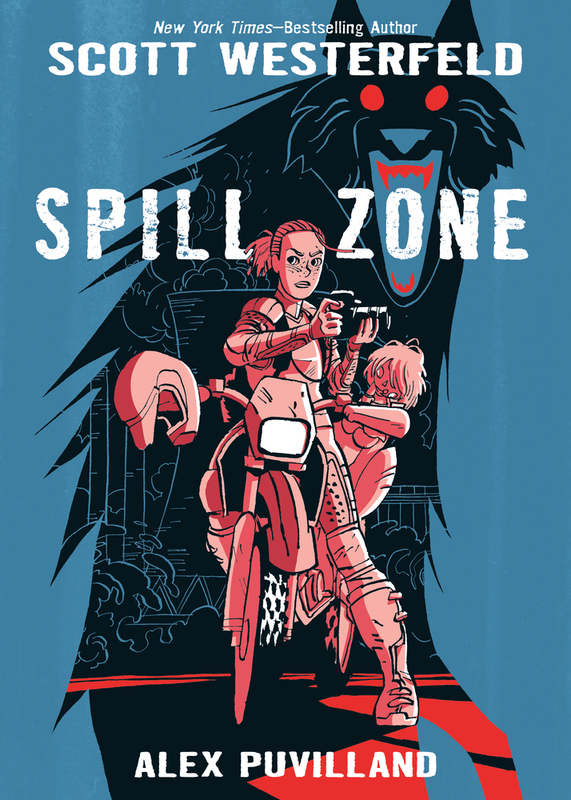 Spill Zone is a mysterious, action-packed, creepy-weird story, and it is ELECTRIC. Addison’s world changed after the Spill. With her parents gone, her sister altered and mute, and her hometown irrevocably twisted, she had to rework her life to carry on. Officially, no one is allowed in the mysterious Spill Zone, and the authorities won’t say what happened there – but Addison explores it, and she has her own rules for survival. The only constant in the Zone is that things will get weird. When the terms change, Addison may be ready – or it might be more than she can handle. Westerfeld sets up a story with a lot of unknowns (re: how the Spill happened, what it did to people, why some kids survived), family tragedy, a sisterly bond, weird, physics-defying phenomena, and art for survival’s sake. While main character Addison works to unravel some of those unknowns and keep her family together, there are other actors who have their own motivations, knowledge based hearsay, and less-than-ethical tactics. Combine that with a daredevil on a dirt bike, and you have the set-up for a thrilling graphic novel. And of course, Mr. Westerfeld delivers. There were two bits of the story in particular that sold me on Spill Zone. The first was Addy’s initial trip into the Zone (that we see as readers, anyway), where she does a bit of a mini-tour with her rules for survival. This scene not only gives the reader the set-up they need to grasp the scope of the Spill, it also establishes danger, immediacy, and Addy’s motivations. And to be completely honest, it reminded me of my favorite part of the film Zombieland. While the story gets a solid A, the art gets an A++++. No offense, Mr. Westerfeld, but the art is the BEST PART OF THE BOOK. That’s as it should be, since pictures are kind of the point with a graphic novel. Alex Puvilland’s illustrations and Hilary Sycamore’s colors bring the action, the eerie atmosphere, and the characters to life. I can’t imagine what the book would have been like in anyone else’s hands. The weirdness of the Zone seems neon, without actual neon burning the readers’ eyes, and the Zone’s unnatural creatures contrast with those untouched by the Spill (but not so much that you feel like you’ve left Earth). In the end, Spill Zone is beautiful, bizarre, and 100% readable. I can’t wait for book 2 (it’s a duology, did I mention?). Recommended for: fans of young adult science fiction, adult science fiction, dark spec fic, and horror, and anyone who perks up at the mention of Scott Westerfeld and/or graphic novels. Fine print: I received a final copy of this book for review consideration from the publisher. I did not accept any compensation for this post.